A deck that is not cared for properly often turns a dull grey color. The degradation is caused by dirt, moss, algae, and plant debris. Decks are a very popular, simple, and cost-effective way to extend the living space of your home, your deck should make it enjoyable to spend time outside, day or night. They also add to the home and extend the entertainment and outdoor dining. Like everything else around your home, decks are subject to the damaging effects of moisture and prolonged exposure to the elements. A deck that is not cared for properly often turns a dull grey color. The degradation is caused by dirt, moss, algae, and plant debris. This soon begins to break down the surface of the planks. Splinters form, creating a rougher surface that is even more inviting to dirt and plants. Before long, you have a dingy deck that’s treacherous when wet and riddled with splinters. The following 3 tips can ensure your decks protection from the elements. After cleaning your deck of all debris with a low-pressure power hose, you will now be able to seal it. When purchasing your sealer make sure it has UV protection, which will protect your deck from the summer sun. To prevent moisture from accumulating over the winter, remove any furniture, planters, or barbecues from your deck every fall and put these in storage. During the winter, immediately remove any build-up of snow. If not removed immediately it can lead to the warping of the wood and water damage. To prevent a buildup of mold and mildew why not make maintaining your deck a weekly chore, simply sweeping your deck clear once a week can prevent the buildup of debris, which if left accumulated can lead to rapid growth in mold and mildew. If barbequing during the summer months, be vigilant of any spilt oil or greases. If not cleaned up immediately the result can be a discoloration of your decks wooden finish. 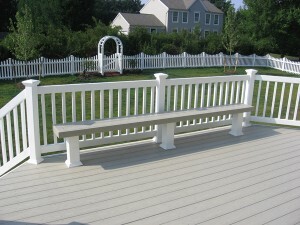 The rearrangement of your deck’s furniture on a consistent basis can also help in avoiding discoloration.